For over 30 years, Pacific Research Laboratories, Inc., also known as Sawbones, has been changing the way medical practitioners train and prepare for surgery. The first and largest provider of orthopedic and anatomical models, Sawbones manufactures realistic reproductions of bones to allow surgeons to interact with it before the procedure and to familiarize themselves with instruments needed for surgical procedures. The foam models are also used in biomechanical tests, new product demontrations and patient awareness. Historically, cadaver bones, animal bones, or even various types of wood were used for medical models, but these materials bring their own sets of limitations. Varying shelf lives and inconsistent mechanical properties impede accuracy and precision in biomechanical tests. When alternative artificial materials are considered, care must be taken to ensure these are uniform in structure, which means there should be minimal variance in properties and dimensions from order to order. In addition, Sawbones is guided by the American Society of Testing Methods (ASTM) for orthopedic implant testing and device testing, so materials used in creating bone models should meet these rigid requirements. Most of all, it should possess properties similar to human bone. Bones consist of two main parts: the hard, outer cortical bone and the inner cancellous bone which is lower in density but has more cellular structure. In order to mimic these components, Sawbones needed a high-caliber polyurethane foam that comes in various densities. Sawbones’ services also called for products that were easily transportable in situations where clients used the models in demonstrations. 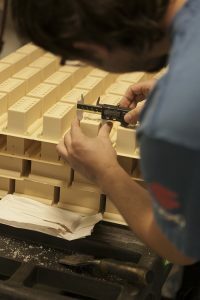 The foam should be easily cut and molded to custom specifications. This led Sawbones to General Plastics. Sawbones uses General Plastics’ LAST-A-FOAM® FR-3700 Performance Core series in their dual density, bi cortical, and CNC machined foam block models. However, from time to time, the LAST-A-FOAM® FR-6700 series polyurethane foam is also used, depending on the requirements. Sawbones was drawn to General Plastics’ polyurethane foam for its consistent cellular structure, machinability and resistance to moisture. The FR-3700 series also comes in various sizes and wide range of densities, 3 – 40 pounds per cubic foot, satisfying one of Sawbones’ most important requirements: the ability to create models that mimic various bone densities. 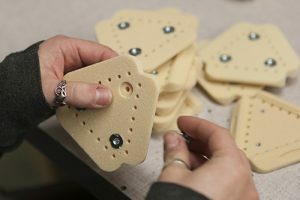 Using General Plastics’ polyurethane foam to create models allows Sawbones to capture the entire range of bone qualities that surgeons might encounter in their operations. The company is able to order specific sizes, densities, and property ranges they may need, without worrying about quality and consistency changing from order to order. “You can select a grade of foam to machine that will deliver a consistent range of desired properties. You will encounter significantly less variability compared to working with natural bone,” said Posch. As a company who develops over 300 customer-requested machined and laminated foam models every year, and who maintains a satisfaction guarantee on all their products and services, Sawbones relies on a supplier who can provide material that meets their stringent requirements. The applications of LAST-A-FOAM® FR-3700 in the medical industry, and beyond, are continually expanding. Contact General Plastics today to see how you can use our top-grade polyurethane foam for your applications. Download our FR-3740 TDS and our FR-3700 PDS.